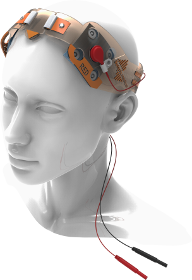 Developed by Soterix Medical Research, the SNAPstrap™ can be used to position Soterix Medical SNAPpads at designated tDCS/tES locations, maximizing reproducibility and subject comfort. 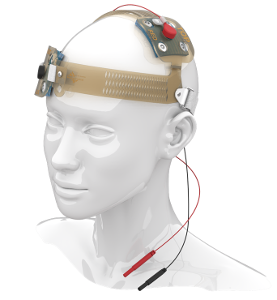 The custom head-gear with fixed electrode sites and built-in cabling makes for a simplistic setup for 1x1 stimulation. Simply open up the pre-saturated SNAPpad™ , snap the SNAPpad™ to the cabling at the designated locations on the SNAPstrap™ , and load the SNAPstrap™ onto the head. No saturation and carbon rubber electrode setup necessary. SNAPstraps™ are engineered in three adult sizes (S, M, L) and three pediatric sizes (pS, pM, pL). Model: SNAPstrap M1-SO (adult: S, M, L; pediatric: pS, pM, pL). Excitability changes induced in the human motor cortex by weak transcranial direct current stimulation. J Physiol. 2000 Nitsche MA, Paulus W.
Transcranial direct current stimulation (tDCS) and robotic practice in chronic stroke: the dimension of timing. NeuroRehabilitation. 2013. Giacobbe V., Krebs HI., Volpe BT., Pascual-Leone A., Rykman A., Zeiarati G., Fregni F., Dipietro L., Thickbroom GW., Edwards DJ. 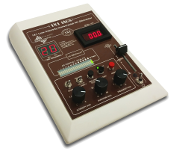 Migraine prophylaxis by anodal transcranial direct current stimulation, a randomized, placebo-controlled trial. J Med Assoc Thai. 2012. Auvichayapat P., Janyacharoen T., Rotenberg A., Tiamkao S., Krisanaprakornkit T., Sinawat S., Punjaruk W., Thinkhamrop B., Auvichayapat N.
Model: SNAPstrap C3-C4 (adult: S, M, L; pediatric: pS, pM, pL). A Comparison between Uni- and Bilateral tDCS Effects on Functional Connectivity of the Human Motor Cortex. Front Hum Neurosci. 2013 Sehm B, Kipping J, Schäfer A, Villringer A, Ragert P.
Dual-tDCS Enhances Online Motor Skill Learning and Long-Term Retention in Chronic Stroke Patients. Front Hum Neurosci. 2012 Lefebvre S, Laloux P, Peeters A, Desfontaines P, Jamart J, Vandermeeren Y. Bilateral transcranial direct current stimulation modulates activation-induced regional blood flow changes during voluntary movement. J Cereb Blood Flow Metab. 2011 Paquette C, Sidel M, Radinska BA, Soucy JP, Thiel A. Model: SNAPstrap Dlpfc-1 (adult: S, M, L; pediatric: pS, pM, pL). The sertraline versus electrical current therapy for treating depression clinical study (select-TDCS): results of the crossover and follow-up phases. Depress Anxiety. 2013 Valiengo L, Benseñor IM, Goulart AC, de Oliveira JF, Zanao TA, Boggio PS, Lotufo PA, Fregni F, Brunoni AR. Acute working memory improvement after tDCS in antidepressant-free patients with major depressive disorder. Neurosci Lett. 2013 Oliveira JF, Zanão TA, Valiengo L, Lotufo PA, Benseñor IM, Fregni F, Brunoni AR. Model: SNAPstrap Dlpfc-2 (adult: S, M, L; pediatric: pS, pM, pL). 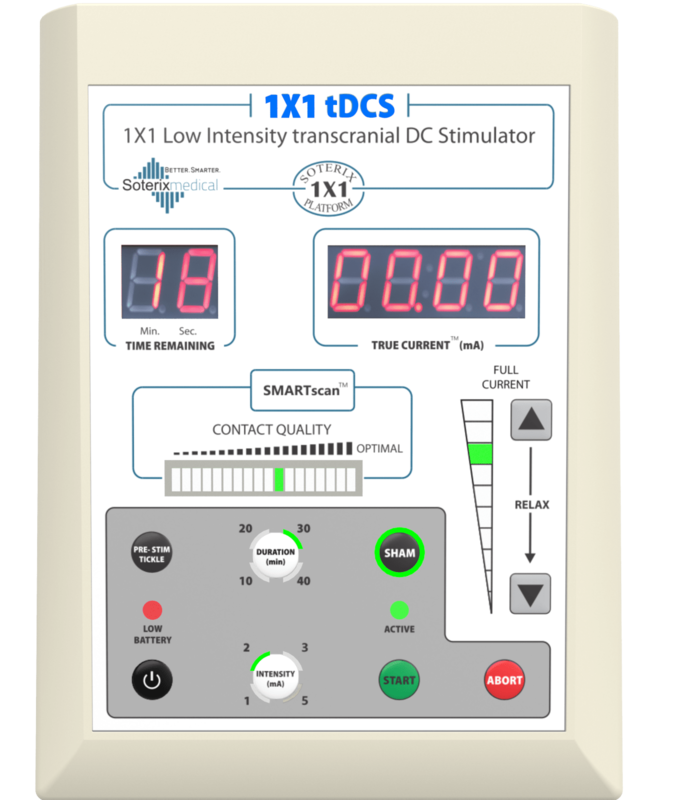 Transcranial direct current stimulation for depression: 3-week, randomized, sham-controlled trial. Br J Psychiatry. 2012 Loo CK, Alonzo A, Martin D, Mitchell PB, Galvez V, Sachdev P.
The preoperative anesthesia evaluation. Thorac Surg Clin. 2005 Schmiesing CA, Brodsky JB.